How many aluminum cans did you recycle or toss out today? Every three months, Americans throw out enough aluminum into landfills that could build the entire commercial air fleet in the country. That’s a lot of metal going to waste. Over the course of your lifetime, you have the opportunity to recycle at least 25,000 cans. What can one recycled aluminum can do? A single aluminum can that’s recycled saves enough energy to power up a television for three hours. And the entire process of recycling it can use is 95% less energy and water and it would to build a can from raw materials. Paper is another commodity that is popular to recycle but even there we can do better. Americans today throw away enough office paper to build a 12-foot high wall from Seattle to New York. That would be a new wall every year. Whenever a company makes paper from recycled paper it produces the contribution to air pollution by 95%. Just one stack of newspaper 3 feet high saves a tree. Right now up to 40% of fiber used to make new paper products in the US comes from recycled sources. Anytime you buy a car board package you should check to see if it’s made from recycled paper. 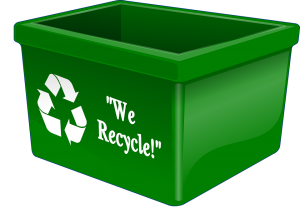 If you are a loyal customer to that company and they aren’t recycling, then you should let them know. Classes of recyclable material that can be remanufactured literally thousands of times. Making glass from recycled material cuts back on related water pollution by up to 50%. Just recycling one glass jar saves enough electricity to light a lamp for 20 hours. All of these recycling facts should have you fired up to do even more recycling. That becomes a factor when you want to get rid of things like appliances, electronics or old furniture. Yes, all of that can be recycled to as long as you hire the right junk hauler. Junk King Sarasota is dedicated to keeping as much stuff out of landfills as possible. They’ll drop off your stuff to a recycling center or charity at no extra cost. If you’re looking for the perfect recycling partner to haul away your junk, then Junk King Sarasota is the call to make. This entry was posted in Saraosta Junk Recycling and tagged Junk King, junk removal, recycling on November 28, 2017 by Junk King. Last updated November 28, 2017 .